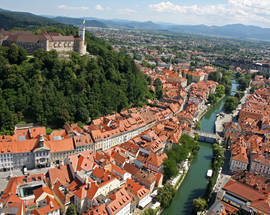 Whether we would like to admit it or not, Ljubljana is a small city. With just under 280,000 inhabitants it doesn’t give off the feeling of a metropolis simply because it isn’t one. Even so, it is the very beating heart of Slovenia, its capital and the epicentre of everything that makes the country tick. The average visitor spends two or three days here, so we’ve decided to put together the perfect 48 hours in our city for your convenience. Where better to start than the centre of the city? One of our favourite things about Ljubljana is that many of the monuments celebrate artists instead of war generals, and the nation’s finest poet lends his name to the main square of the city. France Prešeren also has his monument here on Prešernev Trg, and the spot is the main meeting point in town. 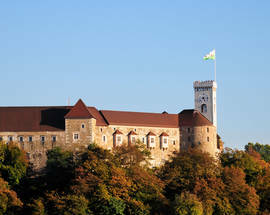 From here you can cross Plečnik’s impressive Triple Bridge with a view up to your next port of call, Ljubljana Castle. There are a number of options for getting up to the castle. A winding path allows one to walk up there (the journey takes 10-20) minutes, although the less fit can also take the funicular or the quaint little tourist train. The castle is home to many points of interest, with towers, exhibitions and tours a plenty, but it is the stunning panoramic views of the city that take the cake. After soaking in the castle, stroll back down to the centre of the city for a spot of lunch. The Ljubljanica River winds through the city and as such both banks are choc full of restaurants tempting you in, with cuisine from all over the world represented. Slovene food itself is a splendid amalgamation of the geography and history of the country, with influence coming in from Italy, Austria, Hungary and the Balkans to the south. You can’t go wrong with any of the options really, so take your time choosing and settle in. After lunch along the Ljubljanica, why not get in a boat and take a tour of the city from the river itself? A number of companies run frequent tours that gives the visitor a unique perspective of the city. Ljubljana really is a city living at a leisurely place, so when the tour is over the best way to spend the afternoon is strolling around Ljubljana’s old town with its gorgeous city squares, narrow streets, beautiful architecture and unique bridges. 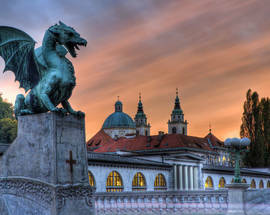 The most unique of these of course is Zmajski most (Dragon Bridge), with its four dragons standing guard. Don’t worry, they aren’t real. Head towards newly renovated Slovenska cesta, now pedestrian only, where we find one of Ljubljana’s most recognisable buildings. When it was built in 1933 Nebotičnik was actually the tallest residential structure in Europe. It has since lost that title, but the rooftop terrace is one of the top spots in the city, perfect for watching the sun go down with a coffee or a cocktail. Truly a must-do when in town. The sun has gone down, so it’s time to play up. 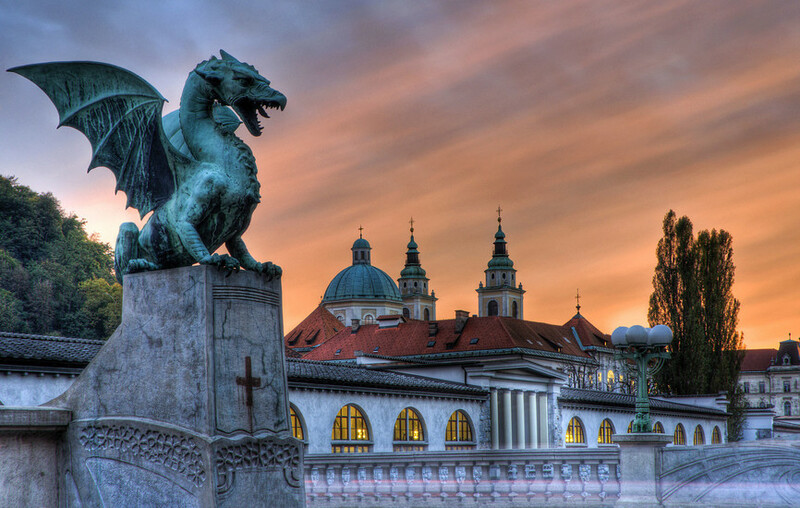 Despite its size, Ljubljana is something of a two-headed beast when it comes to nightlife. Want high culture? The Slovenian Philharmonic on Kongresni trg is the place to go, with its frequent concerts and performances guaranteed to impress. Slovenia’s Austrian influence really comes to the fore here, and it is a fantastic way to spend an evening. Those looking for something a little more alternative however should waste no moment in heading to Metelkova, the throbbing soul of the city. Formerly an army barracks, it has since evolved into a collection of clubs, museums, galleries and more, and the weekends see it packed out with fun-loving folks. Day one is in the bag, a very leisurely day at that, so what shall we do for day two? 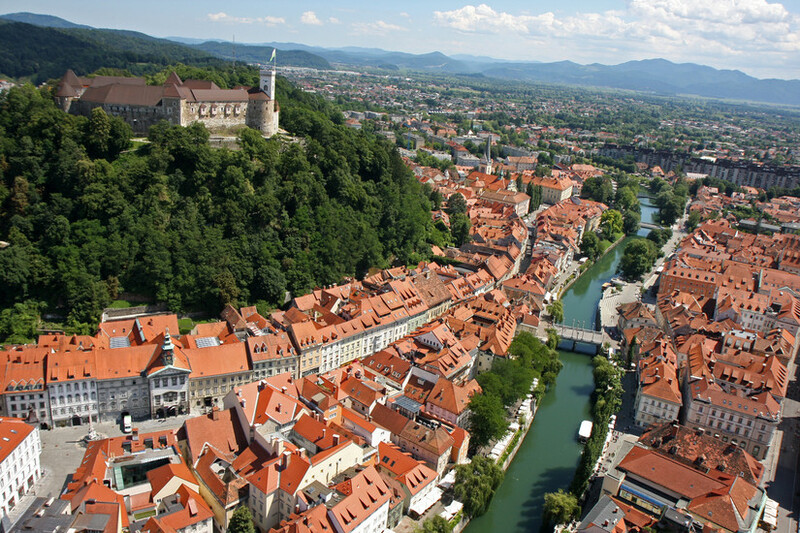 Embrace Ljubljana’s cultural history of course with a day of museums, galleries and monuments. One could quite easily spend hours upon hours in these spots, whether it is to explore Ljubljana’s roman history at the City Museum, the history of the Slovene people at the Slovene Ethnographic Museum, the fascinating science on offer at the House of Experiments or the 150 year history of Slovenia’s most popular beer at the Union Brewery Museum. Art lovers can hit the Museum of Modern Art, the National Gallery, the Museum of Contemporary Art and much more. Throughout the city you will also see references to the work of Jože Plečnik, the nation’s most celebrated architect. One of our favourite Plečnik pieces is the entrance gate to Žale cemetery in Bežigrad, and we frequently have to remind ourselves that this monumental structure is the entrance to a cemetery. Again, this is a must-see in town. Tours of Plečnik’s work are available, but we recommend renting a bicycle and putting together your own. Start this tour at the open-air theatre called Križanke on Trg Francoske Revolucije. Ljubljana’s city park, Tivoli, also demands a visit. Just two streets west of the city centre, Tivoli is a huge green expanse that is full of people eating picnics and relaxing. A number of cultural sights are also found here, including the 17th century Tivoli Mansion and the International Centre of Graphic Arts. The park is best explored by bike. As the day wears on we’re pretty sure you’ll be getting hungry and (for sure) thirsty, and luckily Ljubljana has a number of options for getting to know the food and drink of Slovenia. 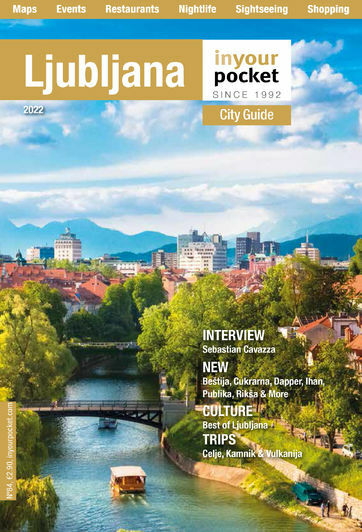 Whether it is the excellent Ljubljananjam foodwalk or tasting Slovenian wine at one of the wine bars in the city centre, we guarantee you’ll be surprised and more than satisfied. To round off your weekend in Ljubljana, we suggest finishing where you (almost) started. 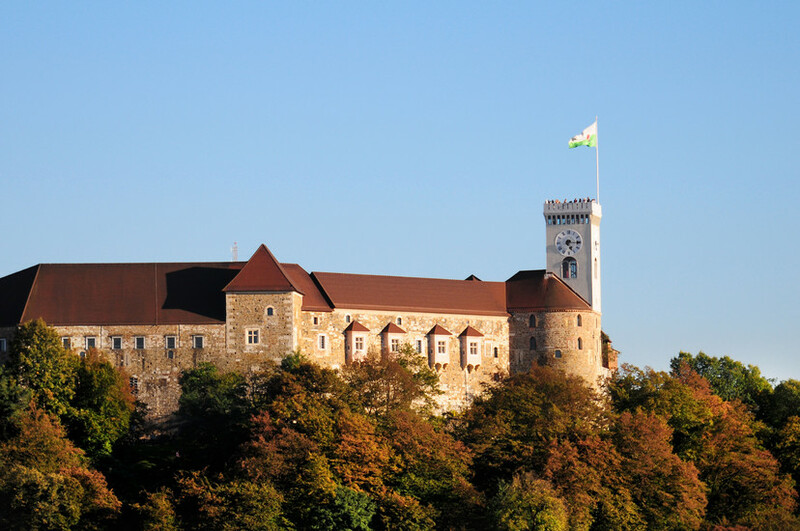 Ljubljana Castle is home to a couple of world-class restaurants, so sit back and relax with gorgeous food as the city rolls out in front of your eyes. The phrase ‘small but perfectly formed’ is often used, but never has it been more appropriate.